Heavy Cream, Pumpkin, Eggs, Granulated Sugar, Milk, Vanilla Extract, Salt, Ground Cinnamon, Ground Gloves, Ground Allspice, Ground Nutmeg. Enriched Flour (Wheat Flour, Niacin, Reduced Iron, Thiamine Mononitrate, Riboflavin, Folic Acid), Malted Barley Flour, Water, Eggs, Pumpkin, Granulated Sugar, Butter (Cream [Milk]), Yeast, Non Fat Dry Milk, Salt, Cultured Wheat Flour and Vinegar (for freshness), Natural Cinnamon Flavor, Ground Gloves, Ground Allspice, Annatto Color. From Frozen: Preheat oven to 35o°F. Remove film from tray and thaw on the counter for 30 minutes. Wrap in foil, place on a baking sheet and heat for 60 to 65 minutes. Remove from oven, remove foil and allow to rest 5 minutes before slicing. From Defrosted: Defrost in the refrigerator overnight. Preheat oven to 350°F. Remove film from tray, wrap in foil, place on a baking sheet and heat for 30 to 40 minutes. Remove from oven, remove foil and allow to rest 5 minutes before slicing. From Frozen: Remove film from tray and thaw on the counter for 30 minutes. Remove from paper tray, slice into 8 equal pieces and place on a microwave safe plate; heat at 50% power for 5 to 6 minutes. Serve warm. From Defrosted: Defrost in the refrigerator overnight. Remove from paper tray, slice into 8 equal pieces and place on a microwave safe plate; heat at 50% power for 2 to 3 minutes. Serve warm. We prefer the conventional oven cooking method, as it gives the bread pudding a bit of crisp and oven-baked goodness. We’re also not fans of patience, so we defrosted overnight in the fridge vs. waiting an extra 30 mins for the bread pudding to thaw and doubling the cooking time. The cooking time (30-40 mins) is a bit vague, as it doesn’t tell you what to look for (GBD outside? Clean knife trick? ), but we split the difference at 35 mins and it turned out perfect. While it’s no secret that we generally don’t crave dessert (room for dessert = precious room for more meal), we’re not immune to it’s attraction. So when we saw this unique blend of pumpkin ingredients in a familiar form factor, we just had to cave. Um… for the sake of our reviews, of course. First, an important note about pumpkin flavored things in general: too often we find that what is mislabeled as “pumpkin” flavor is more accurately “pumpkin spice” flavor – which turns out to be an overload of nutmeg and cinnamon with just a hint of real pumpkin flavor. Not so with this treat. This bread pudding is the real deal, and it’s packed with true pumpkin flavor. We’re talking pumpkin custard AND pumpkin bread mixed into one treat. The results are obviously delicious, and the consistency is just right – soft and creamy in the center, and dry and chewy everywhere else. Also worth noting, the sweetness is tempered well – and you could even accidentally mistake it for a decadent breakfast treat. At least that was our excuse for the 3 days after our initial trial (this dense little loaf has a surprising number of portions). 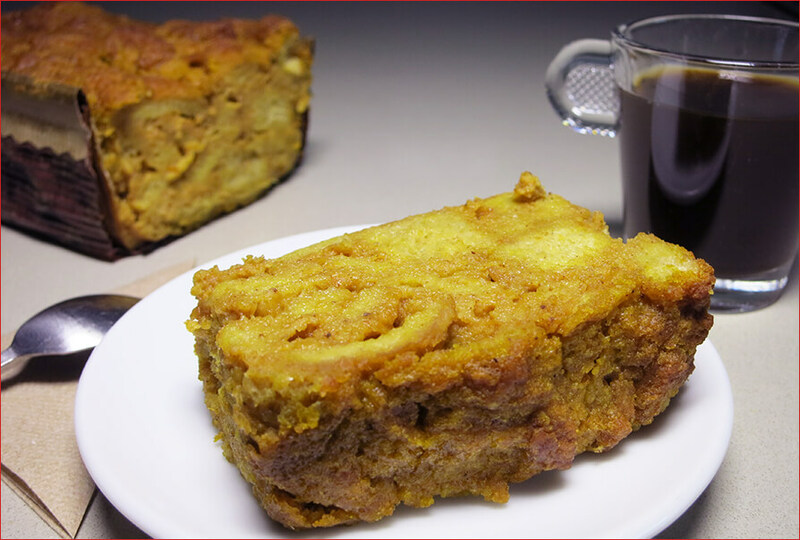 All told, we thoroughly enjoyed this Pumpkin Bread Pudding, and we’ll definitely be picking up a new supply next time pumpkin season rolls around! 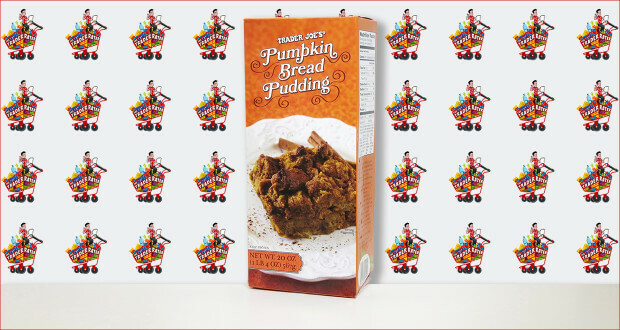 Summary : This bread pudding is the real deal, and it's packed with true pumpkin flavor and just a hint of sweetness. We thoroughly enjoyed it!